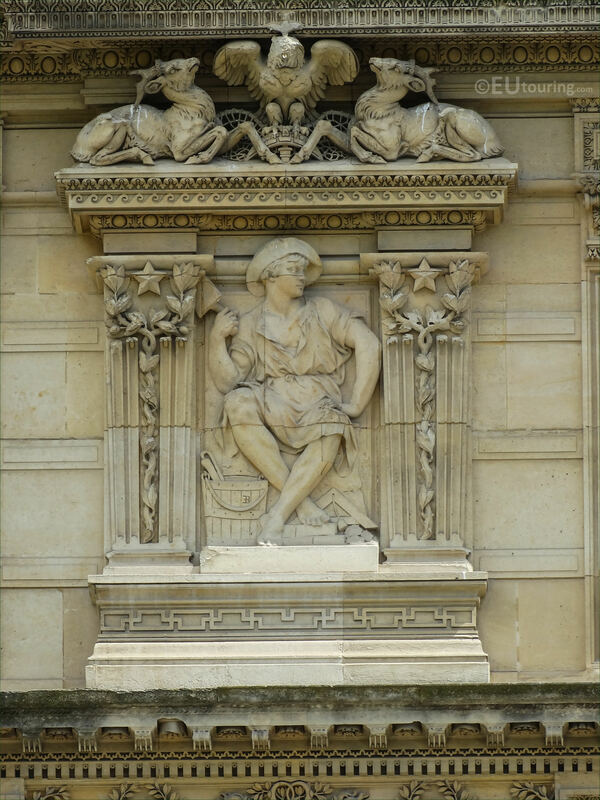 While we were admiring the famous Musee du Louvre located in the 1st Arrondissement of Paris, we took these high definition photos showing a bas relief called La Maconnerie, which was sculpted by Louis Barrias. 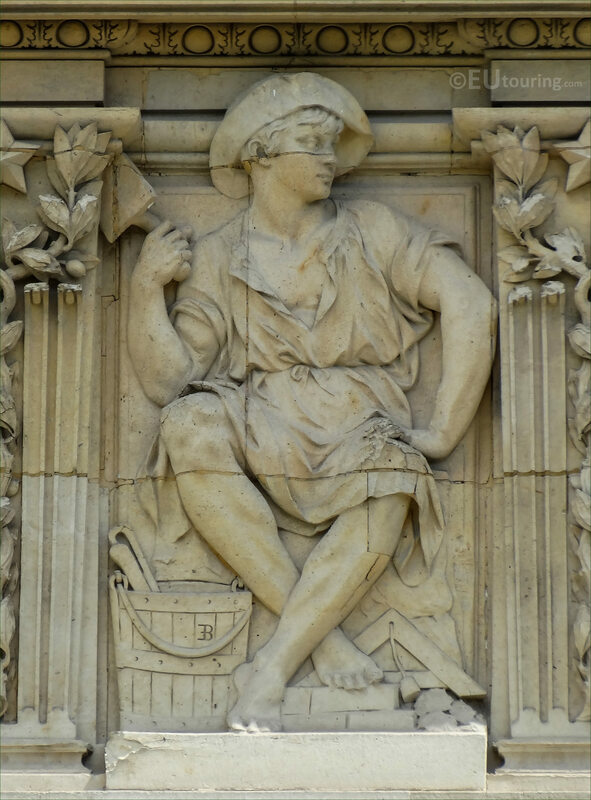 Classed as a low relief in English, this first HD photo shows a bas relief called La Maconnerie, which in English translates to Masonry, and located on the Aile de Marsan, this allegorical sculpture was made of stone and put in place on the former Palais du Louvre back in 1878, yet it is also sometimes referred to as Architecture. Born in Paris in 1841 to a family of artists and with a full name of Louis Ernest Barrias, he initially studied painting before turning his hand to sculpture and was then admitted to the Ecole de Beax Arts, winning the Prix de Rome in 1865, and upon his return saw active service during the Franco-Prussian War, but after this he was entrusted with numerous different commissions throughout a prolific career, receiving many medals and awards along the way. In fact, as well as working for The Louvre, you can see different statues, sculptures and monuments at many different tourist attractions around Paris that were commissioned to Louis Barrias, which include the Palais Garnier, Jardin des Tuileries and at museums such as the Musee d'Orsay. But Louis Ernest Barrias was also commissioned for many funerary monuments at cemeteries like Pere-Lachaise and Montparnasse, and several works can be found in different cities throughout France and in other countries like Rio de Janeiro in Brazil, Copenhagen in Denmark, Tananarive in Madagascar, etc. 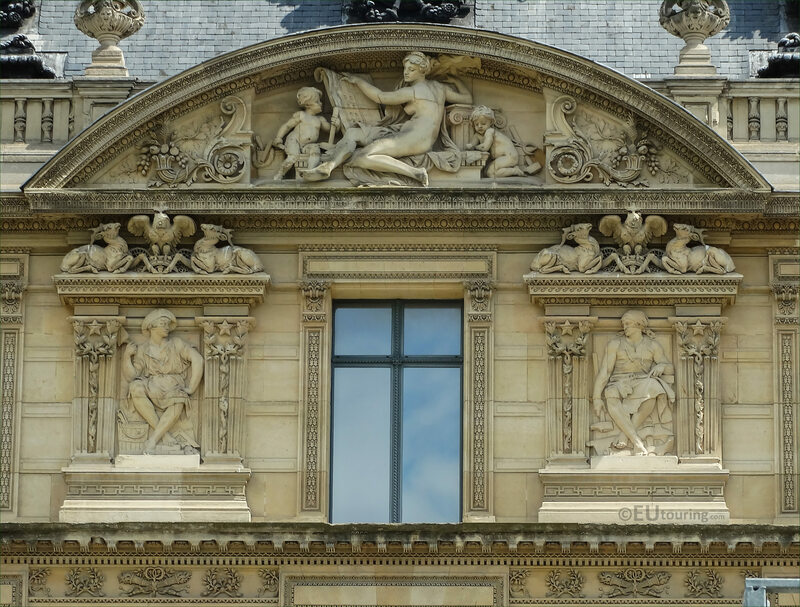 However, here you can see one part of the Aile de Marsan facade with the bas relief of La Maconnerie, or Masonry, which has been positioned to the left hand side of the third window below the pediment on the third level of this wing, which can be seen from thee courtyard of the Louvre Museum called the Cour du Carrousel.